Vampires and mercenaries – what more could you ask for? 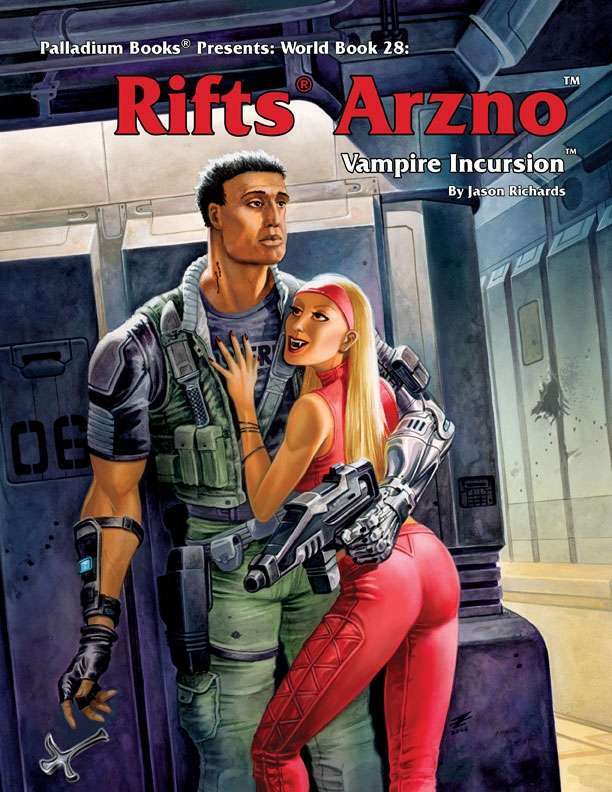 Arzno offers exploration and adventure in the American Southwest, where you will find the Great Trade Road, the Waste, the Grand Canyon, Arzno: city of mercs and magic, and vampires. Unknown to the residents of Arzno, there is a new danger looming: an invasion of the undead, spearheaded by a fierce vampire General who is ready to make his bid at conquering the Southwest. The only people who stand in his way are the heroes of Arzno. Thus, they have been marked as the first to be destroyed. The City and Territory of Arzno described and mapped. New Techno-Wizard gizmos, weapons, armor, power armor, and vehicles. The vampire legions of General Xavier Stuart. The sinister Blood Cult – willing servants of the undead. The mysterious, ghost-filled forest known as the Waste. Other notable people, places and vampires. 160 pages written by Jason Richards; additional text by Kevin Siembieda.